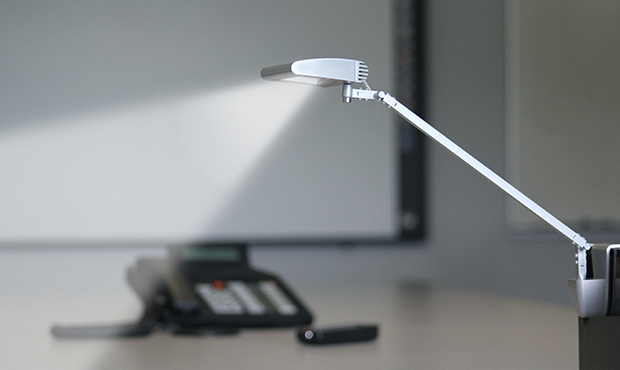 LightCorp introduced “TINO” an asymmetrical personal LED Task Light. Light Corp’s TINO brings a new approach to lighting your work surface. Its asymmetrical design allows you to have 90 foot-candles up to 1’ in front of the light’s head. Using the asymmetrical light distribution design TINO illuminates your work surface without directly hovering over it. TINO’s divider mount system puts light where you want it without having to sacrifice desktop space. Free standing base model is available as well. While always providing an ample amount of workspace light, TINO’s touch- and- hold dimming pad, 4.2-watt system uses little power even at full 390 lumen light output. Along with 7 fractional LEDs rated for a 50,000 hour lifespan TINO comes with a 10 year warranty. Every TINO also comes standard with an energy saving occupancy sensor. TINO will never waste energy because it is only on when it is being used. Tino is available in three standard colors White, Silver, and Black. LightCorp says that TINO will be available at the end of the month.